It’s finally here—spring and the bright pink stalks that come with it. Yes, we’re talking about rhubarb season! Traditionally, rhubarb is used in compotes, marmalade, juice, cakes, and other baked goods. But the versatile vegetable (you heard right, it’s not a fruit) is equally delicious when used in spicy chutneys or paired with grilled lamb. Rhubarb sprouts in spring, sending out thick fleshy stalks and large leaves from its underground bulb. The stalks are the edible part of the plant and are harvested from April to June every year. Depending on the type of the plant, the stems can be green or red, and the taste can vary from sour to a subtler sweet and sour. 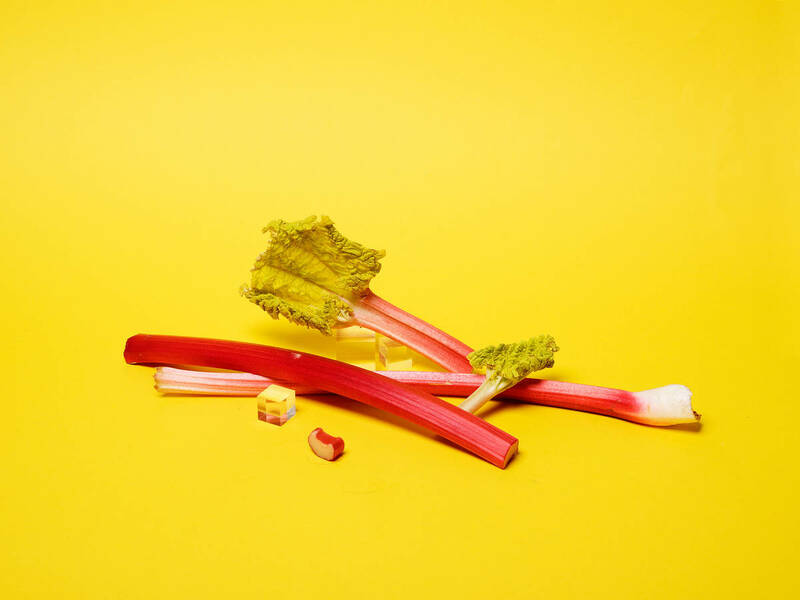 Although rhubarb is a hallmark of springtime dishes in America, Britain, and parts of Europe, the plant actually originates from China, where it was prized for its medicinal qualities. Rhubarb is packed with vitamins and minerals, including vitamins C and K, iron, potassium, and magnesium. However, rhubarb stalks also contain a small amount of oxalic acid, which is poisonous if consumed in large quantities (if you believe sharing is caring, you’re not going to run into any trouble). The leaves contain high amounts of the toxin, which is why they are not to be eaten at all. If for health reasons you need to pay special attention to your intake of oxalic acid, you should choose red rhubarb stalks over the green ones, and always remember to peel and blanch the vegetable. When you buy rhubarb, you should look for rhubarb stalks that look glossy, feel firm, and have a gentle sheen—all indicators that the rhubarb is particularly fresh. Don’t buy rhubarb that looks dry, too fibrous, or has wilted leaves. Rhubarb will remain fresh for up to a week, if wrapped in a moist kitchen towel and stored in the fridge. Since rhubarb is only in season for three months, you might also want to stock some up for fall or winter use. To do so, simply wash the stems, cut into cubes, lay them onto a sheet, and freeze for about 2 hours. You can then transfer them to a freezer bag and reach for them when an out-of-season crumble craving hits. Before cooking rhubarb, you should first clean the stalks and wash them with water thoroughly. You can remove the green leaves on top of the stalk and the dry woody end. While you don’t have to peel the young and more tender rhubarb stalks, always remember to do so for the older and more fibrous ones. Place a knife at the end of the stalk and peel it by moving the knife upward towards you. After that, you can cut the stalks into cubes and further prepare them by blanching in water or cooking in their own juice.